When homeowners want to make the most of the space in their house, they need to make sure they read more about overhead storage racks. These storage racks are helpful for the homeowner, and they are easy to install when the ceiling in the garage is very high. The best storage racks will match the size of the space, and the homeowner will be able to get in and out of those units simply. These sliding racks are easy to use because they slide on and off the track easily. The track is easy to use, and the homeowner can fit as many storage containers as they want. The track can run all across the ceiling, and the entire ceiling can be filled with the containers. The containers will also make it easy for people to label them because the labels will go on the bottom of each container. The racks may also be set next to each other so that each container has its own track. 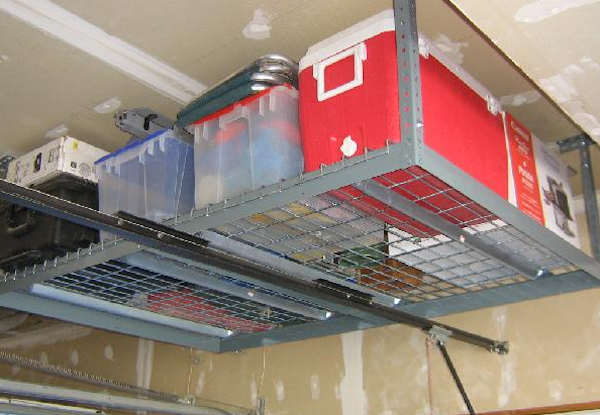 These sliding storage racks are easy to install when the homeowner can find their rafters, and the rafters make it easy for the storage racks to be solid. There are many ways that homeowners can use hanging hooks to make sure that they have storage space on the ceiling. Bikes and other toys can hang from the ceiling, and the homeowner will not have to worry about running out of space in the garage. The homeowner will be able to use the garage for all their vehicles without bringing any more mess into the garage. Also, tools can be hung from these hooks to make it easier to find them. When the homeowner is using their garage as a place to do their work, they need to make sure that they are hanging each tool up. Hanging the tools up makes it much easier for the homeowner to make use of these tools. When the homeowner wants to have a better storage space in the garage, they need to be sure that they are working on ceiling storage. These storage systems are easy to install, easy to use and makes labeling the items simple. That is such a genius idea! We are running out of storage space so we will look into this! This is a great idea, especially since so many houses now have high ceilings. Thanks for sharing! I actually saw something similar to this on a t.v DIY show a little while back and I think it is very smart. awesome idea and more space for storage! great! This is such a great idea, as we head into Fall season here and need extra storage in our home (someday I want a garage) I have been looking at our basement and mud room for ideas on shelving to store more things. I like this idea of using the ceiling! I need to use these ideas in my garage. This is such a great idea. This will add more storage space in my basement. my husband is DYING to make something like this for our garage! he is so unhandy. hopefully this could help us! This is a brilliant idea, thank you. These are great tips, I’m always needing more storage space and never thought to use the ceiling. What a fantastic use of space. I’ve seen some use this also for hanging bike and other oddly-shaped things. I’ve seen this before and I’ve always thought this was an awesome idea. I love how it gets everything out of the way and makes things neater. We had some racks installed over the summer. Love them! What a great idea! We have a 2 car garage but can only park one in it because of all of the junk! Thank you! This is a great idea. I think my other half will be kept very busy this weekend! Fantastic! We so need to do something like this in our garage! A few years ago my husband installed a few ceiling racks in our garage, and they’re perfect for keeping our junk out of view. I would have never thought of anything like that, but what a wonderful idea! This is a great idea! I have some stuff I know I can store this way. That is a great idea for our garage, we have so much in there! I love this idea for my garage! My mom has stored her Christmas decorations in the rafters of her garage for as long as I remember. It works great and always gives me a smile when we pull in and see her light-up reindeer smiling down on us. This would be a wonderful solution for us! We are really trying to utilize every bit of free space in our home.